The company Aristocrat is responsible for the launch of Lucky 88 slots, which is inspired by the Chinese culture where the number 8 is the source of a lot of luck. Its graphics are nothing more and nothing less highly representative symbols of this culture, cloth lamps, a swan, a conical tower, the traditional reel, a golden monument, the golden lion and a Chinese emperor or an elder wise. Lucky 88 easily catches players with its attractive and bright theme, plus free spins bonuses and other wild payment bonuses with multipliers that will increase the luck of all users. The Chinese have a strong belief that the number eight has a pronunciation quite similar to the word “wealth”. Visually, the screen of this game has a red background backdrop; this color is predominant along with orange and yellow, five lanes with three rows and adjustable payment lines. The graphics and images are quite bright and sharp, their visual quality extremely high. In addition to a very well distributed bottom panel with the necessary information revealed to the naked eye, you can also see the Aristocrat team logo on the left side, spin options, auto spin, visualize the gains up to the moment, the bet made, the previously selected lines, option to enjoy the game in silence in case the music is annoying or not to the taste of the player, in short, an extremely broad menu. This betting machine has 25 pay lines, there are many or very few, just to give a good amount of opportunities to fall different combinations on the reels that lead directly to victory. Although the player has the aforementioned 25 payment lines, you can choose if the number you want is lower; Once you select them, they will activate automatically, lighting up on the monitor and thus the player will know in which lines the correct and pre-established combinations will be located. In addition to this, Lucky 88 has many options to bet; therefore it is a slot that gets the attention of players of many different classes. When the player selects the bet he may choose the call Extra Choice; this is only possible if you play all the payment lines, it should be noted after this five credits will be added to the bet and so you can activate bonus options that take place in the free spins. These free spins that are present in the Extra Choice are; if within twenty-five free spins: the old wild card is within the combination that caused a victory, the prize won will be multiplied five times to eighteen times. Within fifteen free spins and the old wildcard is related to the victory obtained, the prize won will be multiplied eight times up to thirty-eight times. Eight extra turns and the old joker is part of the victory, the prize that is won will multiply from eighteen times to eighty-eight. They go four extra turns and the old man completed the combination to achieve a victory, the prize will automatically multiply by eighty-eight. The RTP, return to the player of the bets made in the slot game Lucky 88, is up to 95.6% only if its extra function is previously activated. How does this work? Well, if the player bets at least NZD100 the already passed good number of rounds, must get back around NZD95.60. This index is just slightly above average. All oriental themes related to Chinese or Japanese culture, Asian in general, is increasingly present in slot games because it certainly has a different charm for all those fans or players who have a bit of curiosity about this society. The Asian culture has a lot of attractiveness and a very characteristic aura of calm, Lucky 88 seeks that the players will have passed between these Asian characteristics, that without caring that before they were not very seen, today is the center of many looks. Another slot with a regional theme created by the same Aristocratic team is the Big Ben slot, but the list goes on. Lucky 88 slot machines has a list of available bonuses that players can take advantage of and win thanks to the payment power that Aristocrat implemented. The users that just start playing will have many chances to receive prizes and get victories that translate into cash. Gambling is a well-known option, this is the selection of a card between two different colors, if the player guesses its color, as a result, the credits will multiply and if not, then they simply will not. 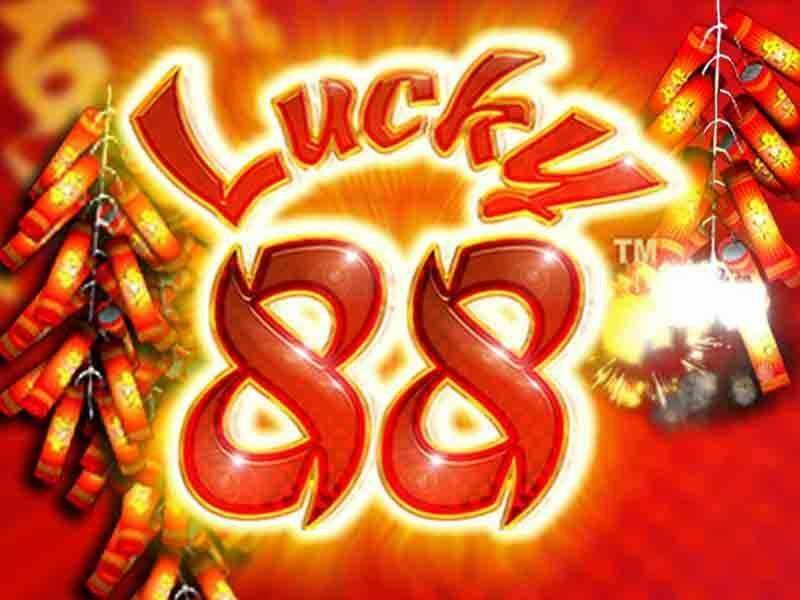 Among the many bonuses and prizes available, the game Lucky 88 also has an extra game of dice, where the player will roll a total of eight dice and thus win multiple extra prizes. The more dice you show the number eight, the better. For each die with a revealed eight that the player gets the prize will be in cash. When the game is running, the player must wait for the lantern graphic to fall on the available reels. This way it will now be possible to unlock the bonus feature. There you will see different options available games. Players will be free to choose after rolling dice different prizes, extra games, bets or cash. The old man in this game is the wild card, replacing the other graphics, helping in that ways to form the combinations that lead to victory once the reels spin. If this graph of the elder is part of the correct combination, it has the power of a multiplier in a random way, from twice the value of the prize, ascending three times, five times, eight times, up to eighty-eight times. Imagine the older man’s wisdom! And this is not all, because if you can combine with other wildcards graphics too: you can give the player a bonus of up to 888. Still not surprised? This old man is luck personified! After all the above mentioned, Lucky 88 shows to be a surprisingly attractive game, funny and it does not stop impressing its quantity different characteristics that help the player to boost his profits. It will easily activate combinations that lead to victory while the main game is underway, this due to the pay lines and the very generous old wildcard extremely wise. Long live this old man. The company NYX has available a demo version of Lucky 88. Where as it goes by the 100 turns and thanks to the multipliers of the old man’s graphic: at least 200 credits will be won. It’s better for players to believe in this lucky number because this game is from another world. Lucky 88 is extremely curious, and not only that but also manages to maintain its popularity for the quality it presents. Everyone loves this game for the wonderful bonuses they have. Also based on an extremely popular culture because of how remarkable it can be. This slot can be played in virtual casinos for real money or completely free. Superstition or not, players take to the adventure, able to take a chance to see if this famous number eight really brings luck.